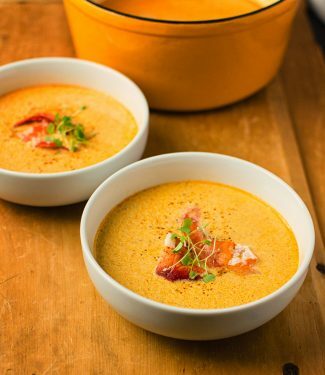 Lobster bisque. This is soup for when you want to impress. Creamy. Rich. Luxurious. It’s everything wrong with French cooking. And it’s everything right with French cooking. Wonderful stuff indeed. I love making soup when I entertain. Everybody loves a good soup. And it’s a first course you can make ahead. Like before lunch. Takes the pressure off the cook. And lobster bisque is seriously fancy fare. This isn’t your run of the mill soup. It has lobster in it after all. I don’t know about you but I save lobster for when I want to impress. And this soup impresses. The traditional approach is a lot of work. Cook whole lobsters. Shell them. Flambe the shells. Make lobster stock. Then start making soup. That’s the completely over the top way to do it. It’s amazing. The depth of flavour is almost surreal. But it’s a lot of prep. And have you ever smelled lobster stock cooking? That’s something best done outside. You do not want your house stinking of lobster boil when your guests arrive. Unless you have an industrial strength hood fan it’s not something I recommend. This is a scaled back version. It’s not trivial as far as soup goes. But it is way easier. And you don’t stink up your house. I’m not usually about cutting corners. Mostly I go for it. But in this case there are two little tricks I use. Clam juice instead of lobster stock. No smell. Briny ocean flavours. Almost a no-brainer really. Canned, frozen lobster is the other one. It’s pretty good stuff. Not the same a whole lobster. But it still has that sweet, fresh taste of lobster. Not like you’d imagine anything from a can would be. Don’t know why it works. But it does. Way better than that canned crab stuff. That’s just nasty. After that it’s pretty straight forward. No real surprises. Layers of flavour. Aromatic vegetables and mushrooms for an earthy note. Tomato paste, white wine and sherry layer on the complexity. A hint of cayenne for a bit of bite. And lots of cream of course. This is fine dining after all. A simple version of a French classic soup. Clam juice replaces lobster stock to and whole lobsters are replaced by canned lobster meat. Plan on small portions. This is a rich dish. Heat a sauce pan or pot large enough to hold all ingredients over medium low heat. Melt the butter. Add the shallots, carrots, mushrooms and celery. Cook until onion is translucent, about 10 minutes. Add tomato paste and cook a minute more. Add stock, clam juice and reserved lobster juice and simmer 10 minutes more. Separate the larger lobster pieces (claws) and set aside. You should have about 1/2 cup little bits left over. Puree the soup along with the 1/2 cup of little bits of lobster. Wipe the pot out. Return the pureed soup to the pot. Mix in white wine and sherry and simmer, loosely covered for about 30 minutes. Add cayenne. Simmer 5 minutes more. Add whipping cream and heat through. Add large lobster pieces and serve. Garnish with a bit of paprika or piment d'esplette if you can get it. This bisque is fairly thin. If you want a thicker bisque mix a bit of cornstarch into 1/4 cup of the soup before you add the cream. Bring to a simmer. Once you have the texture where you want it (or a bit thicker than you want it) add the cream and heat through. In appetizer, french, seafood, soup. Bookmark the permalink. Haha – Joyce that’s a super nice comment. I’m too lazy to have a restaurant. That’s real work. I absolutely cannot stand the smell of lobster shells cooking in my house. Funny because I love it outdoors. This is my way of getting the best of both worlds. A little cheat for the home cook! This lobster bisque sounds decadent and amazing! Would be perfect for dinner guests or a special dinner at home for two. I love that it can be made in a relatively short amount of time too! Do you think I could use my immersion blender to puree the soup right in the pot? Thanks! Yum! I love a good lobster bisque! 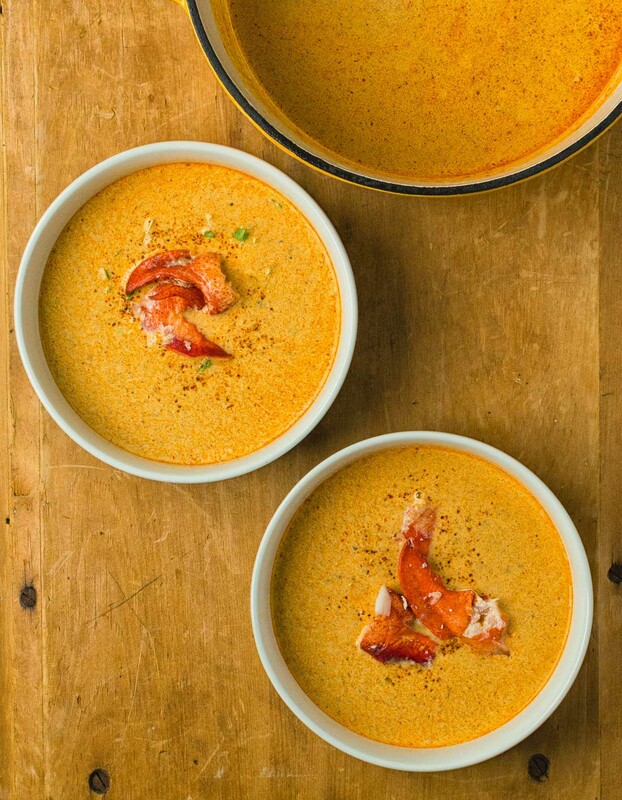 I love a good lobster bisque and this one looks mouth watering. I bet that it would go nicely with a good riesling.